This site lists all of Peru's radio stations and their websites. A great site, covering all genres of music. Australians, depending on where they live, can hire Tunari for play traditional Andean music. For more about Andean music and links to music websites, go to Page 16. The Path of the Heart has programs that feed hungry children, provide safe, comfortable homes to orphans and help educate exceptionally bright and gifted youngsters. The Path of the Heart is a 501©(3) charitable non-profit organization where 100% of your tax-deductible donation goes directly to those in need. Path of the Heart supports 4 orphanages, 19 children in universities and trade schools plus 3 Food-lines that feed 750+ street people a healthy, balanced meal every day. This wonderful non-profit organization devotes its energies to supplying free animals to impoverished families throughout the world. For our purposes here, they have a llama project in Andean Bolivia. This organization supplies good breeding stock llamas to the families, because through centuries in inbreeding, the quality of their animals has degenerated. HPI stipulates that each family who receives a female llama must give away her first female offspring to another poor family. HPI also helps the people plant native grasses and learn how to take better care of their llamas. Similar projects supply cattle, water buffalo, rabbits, geese, chickens, bees, sheep, goats, even tree seedlings appropriate to the indigenous communities they are helping. We can donate a whole animal or a share of an animal, or even a whole ark of animals!  INCA ARCHITECTURE, Less is More-Much More! Dr. Ric Finch, of Rutahsa Adventures, Inc, has written a magnificent treatise on Andean architecture, accompanied by many wonderful color photos. 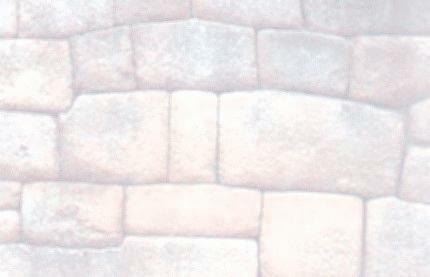 of various sites, including Sacsaywaman, Cusco, Tambomachay, Ollantaytambo, Pisac and Machu Picchu. These photos are some of the clearest and best that I've seen on the internet. Even if you're not interested in the technical details of Incan architecture, these photos are worth looking at, as they'll give you a feeling of almost being there in person. A must-visit site! Beautiful photos and account of Andrys' 1997 visit to Peru. Also check out Andrys' other album pages. A very interesting and recommended site. The following links are to sites specifically about Machu Picchu. This site contains 12 pages of exquisite photos. If you have the proper device to link your computer to your HDTV, view these photos on the large TV screen. You'll almost feel like you're really there! Ron Davies' site has a lot of info and beautiful photos. This site has many links covering a wide range of subjects about Peru and its sacred sites, especially Machu Picchu, and South America. You can spend hours browsing here. Just like its title suggests, this wonderful website covers a broad range of subjects. Songs, poems, stories are in Quechua with both English and Spanish translations, as is much of the text elsewhere on the site. Lots of lovely photos, mostly of the Andean people. My favorite: the little 'puppy and his boy.' Cultures of the Andes also offers lessons in Quechua, vocabulary, etc free on the internet, as well as on tapes and Cds in English and Spanish. It is best to learn Quechua by hearing it spoken as well as studying the printed text. Also on this website are some Andean crafts for sale and links to other Andean sites. A must-visit site! Daniel Statnekov is probably the first modern person to research the purpose of these ancient ceramic vessels. He discovered that if one blows into the vessel, very high frequencies are produced that result in an altered state of consciousness! Apparently these vessels were precisely psychoacoustically tuned. He believes that ancient Andean shamans used these vessels in their work. Each vessel was buried with its owner. The Andeans never talked about these vessels with their Spanish conquerers and apparently stopped making them after the Spaniards arrived. Statnekov developed an exacting technique for creating modern versions of these ancient vessels. Statnekov passed on his techniques to Don Wright, who now makes many sets of vessels. An insight struck Don one day that the method of precision constructing and tuning them that he'd been using had "frozen them into the evolutionary level of one of the last cultures (Chimu) to make them." He intuited that the vessels should have their tuning altered, raising the frequencies they produce to be more in alignment and harmony with the present day. Several years ago Don arrived in Peru with a set of whistling vessels for the elders of the village of Q'ero. Juan Nuñez del Prado took him to Q'ero for the gifting ceremony. The elders were thrilled. Don told me that they kept saying, "The vessels summon the apus." A few years ago I had the opportunity to participate in a whistle blowing session using a set of vessels made by Don. We gathered outside in a lovely wilderness setting in the Pocono Mountains of eastern Pennsylvania (USA). While I was waiting my turn to blow on one, I listened with closed eyes. Then came my turn to blow. The effect was quite startling and definitely put me into an altered state of consciousness. When I relinquished my vessel, again I listened with eyes closed. Suddenly I was aware that our group was surrounded by myriads of nature spirits and devas! I intuited that the frequencies of the sounds had attracted or perhaps summonded them. They felt confused, as we had summoned them, but weren't paying any attention to them! At that time I didn't know anything about the Andean apus and ñust'as. I'm very glad that Don told me what the Q'ero elders said about the sounds of the vessels summoning the apus as this confirmed my own intuition about the power of these vessels. Some day I hope to purchase a set of vessels from Don. "An Annotated & Illustrated Collection of Worldwide Links to Mythologies, Fairy Tales & Folklore, Sacred Arts & Traditions" by Kathleen Jenks, Ph.D. One of the greatest collections of annotated links for Andean mythology, as well as textiles, ceramics, language and other aspects of the Andean culture that I have found so far. A must-see site! This interesting article from 07/19/99 about Miami, Florida's unique Coral Castle presents basic information about its builder and various theories about how he was able to move coral boulders weighing upwards of 30 tons all by himself. Did he really rediscover the means used by ancient builders in the Andes and elsewhere? If you're interested in agriculture, the above links to a research report about three indigenous Andean tuber crops other than the many varieties of the so-called white potatoes, which also originated in the Andes. Black and white photos of these crops and their tubers spice up the usual text, charts and tables. In another article, I have summarized how the Peruvian traditional farmers plant their potatoes by the stars. Here you can read news articles about the latest events, laws, government rulings and enforcements concerning the North American Native People. Even though you probably won't see any articles here about the Andeans and other indigenous people of Central and South America, you can get an idea of the hassles and obstacles that indigenous people the world over have faced and are continuing to face in these modern times. If any reader knows of any similar news website devoted to the Andeans, please let me know.